It is a bittersweet time. Jon Stewart will interview President Obama on Tuesday night, but will then bow out of The Daily Show on August 6, meaning that Stewart's 16-year tenure as the hit show's host is rapidly approaching its end. 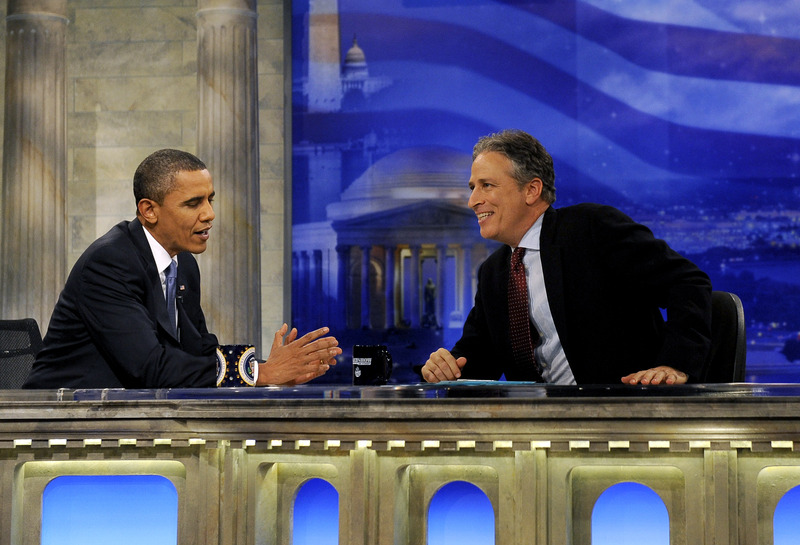 This should be all the more reason for you to watch Obama on The Daily Show — after all, it will probably be Obama's last interview on the show as sitting president. Tuesday night's episode will mark his third appearance on the show as president and seventh overall. Don't have a TV? No problem, I've got you covered. There are a few different ways you can watch the show tonight, and it promises to be an important moment. And if you're mournfully preparing for Stewart's impending departure, you can also take advantage of Comedy Central's "Month of Zen," which started in late June — the network is live streaming an online marathon of every episode of The Daily Show that Stewart has ever hosted, starting with his first, from 1999. What will they talk about? Obama's recent visit to a federal prison? The 2016 presidential race? Donald Trump's hair? You'll have to tune in at 11 p.m. ET to find out, and here's how you can do that. You don't need a TV to watch, and you don't even necessarily need cable. If you download the free Comedy Central app from iTunes and have a sympathetic (and willing) family member, friend, or pet who does have cable, you can use their cable provider login to watch The Daily Show live on the app. And if you absolutely can't find anyone who has cable — not even your cat, who you know has been binge-watching Orange is the New Black — then you can just wait until Wednesday, and the full episode will be available to watch on the app. In addition to the Comedy Central app, you can also catch the full episode on the Comedy Central website on Wednesday — no cable login required! And if the aforementioned family member, friend, or pet didn't like you enough to let you watch the episode live, but is willing to give you their login information the next day, you could also log onto the Comcast XFINITY website to watch. Don't forget about Hulu, either! Hulu also posts full episodes of The Daily Show the day after they air, and they stay online for 30 days. If you're like me and never got around to making a Hulu account, you can sign up for a free trial, which will give you eight full episodes. Now, you have no excuses. Unless you're currently trying to get to the top of Mount Everest and don't have an Internet connection, you should definitely try to catch the show, either live tonight or as an archived episode on one of the various avenues mentioned above. Enjoy this historic moment!